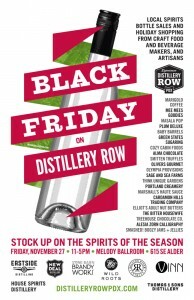 Black Friday on Distillery Row! Members of Distillery Row are getting into the spirit of the season with their 4th Annual Black Friday on Distillery Row holiday shopping extravaganza at Melody Ballroom in Southeast Portland. The event offers a unique opportunity to sample and purchase bottled spirits from eight Distillery Row distilleries–New Deal Distillery, House Spirits, Stone Barn Brandyworks,Eastside Distilling, Vinn Distillery, Rolling River Spirits, Wild Roots Vodka, and Thomas & Sons Distillery–all under one roof. Also on hand will be samples and goods for sale from several of Portland’s most unique food, beverage, and crafts artisans, including Alma Handmade Chocolates, Cardamom Hills Trading Co, Alesia Zorn Calligraphy, Masala Pop, Marshall’s Haute Sauce, Portland Creamery,Smashed! Boozy Jams & Jellies, Sage & Sea Farms, Marigold Coffee, Mee Mee’s Goodies, Think Unique Gardens and more.